In today’s review we will talk about the Alera 2-Drawer Lateral File Cabinet. 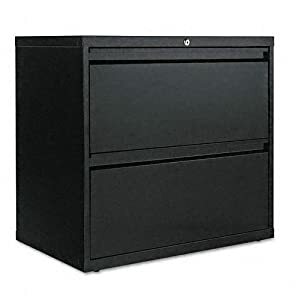 As always, here you will find the pros and cons of the Alera 2 Drawer File Cabinet, the main features that it offers and other important details that I believe you should know about this file cabinet before you buy it. What Is The Alera 2-Drawer Lateral File Cabinet? The Alera 2-Drawer Lateral File Cabinet features deep drawers with side to side hang rails which ensure a much easier accommodation of letter and legal size hanging files. This file cabinet also has reinforced double wall drawer fronts which provide more stability to the product. Apart from that, the Alera 2-Drawer Lateral File Cabinet features a single lock system which easily secures all the drawers. This is a 2 drawer file cabinet, available in three different colors – black, light gray and putty, and a great addition to any office which needs extra space for keeping their paper work. This file cabinet is available in four different sizes as well, depending on your needs. It is also important to note that the Alera 2-Drawer Lateral File Cabinet features levelling guides for uneven floors. To protect it from scratches, this piece of furniture also has a durable finish. This is a lateral file cabinet type, able to keep the following file size formats – letter, legal and media. Overall, the Alera 2-Drawer Lateral File Cabinet is a well built solid piece of furniture which can be an excellent addition to any modern office looking for extra space for keeping their paper works. This 2 drawer file cabinet is available in three different colors and four different sizes which make it much easier to choose the right option that will easily match with the rest of the furniture in the office. In addition, the Alera 2-Drawer Lateral File Cabinet features deep drawers with side to side hang rails that ensure a much easier accommodation of letter and legal size hanging files. We also like that to protect it from scratches the Alera 2-Drawer Lateral File Cabinet also has a durable finish.